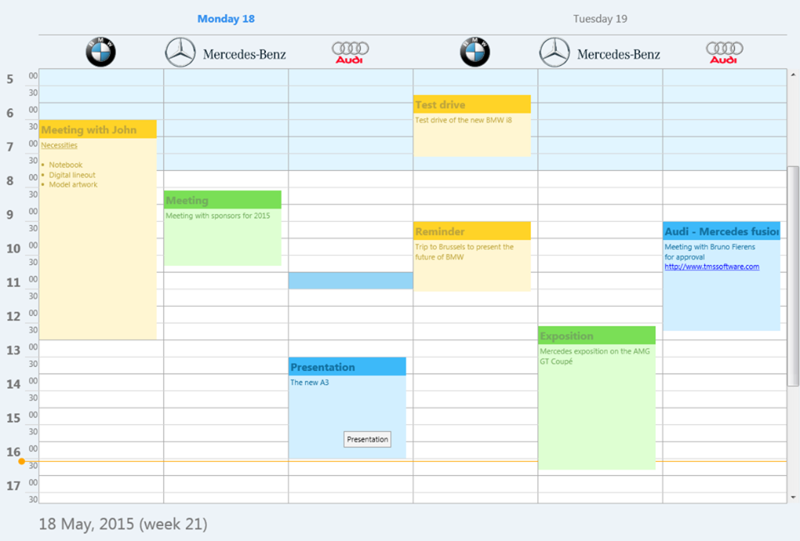 We're thrilled to introduce to you the TMS Planner for FireMonkey, in short TTMSFMXPlanner that has been in development for many months and that is near to being released now. While TMS Planner for FireMonkey design benefits from the significant experience the TMS team built-up with the award-winning VCL, IntraWeb and ASP.NET Planner components, the new component has been architected from the ground up for cross-platform, multi-device usage. This includes tuning for performance & footprint to run smoothly on Android or iOS smartphones and making the component flexible enough for complex scheduling applications in desktop or tablet applications. 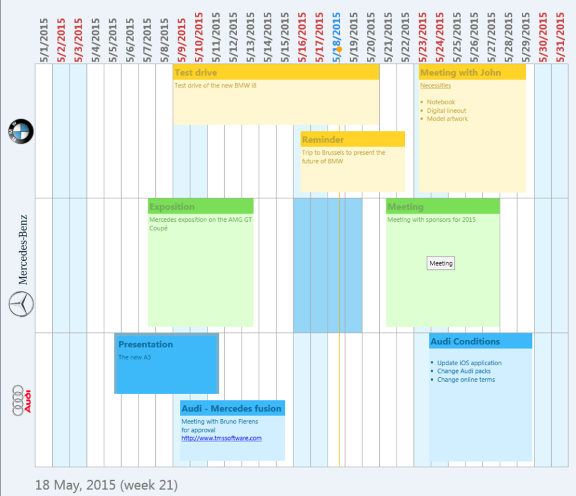 In a nutshell, the TMS Planner for FireMonkey is a user-interface control representing a timeline and events for single or multiple resources. 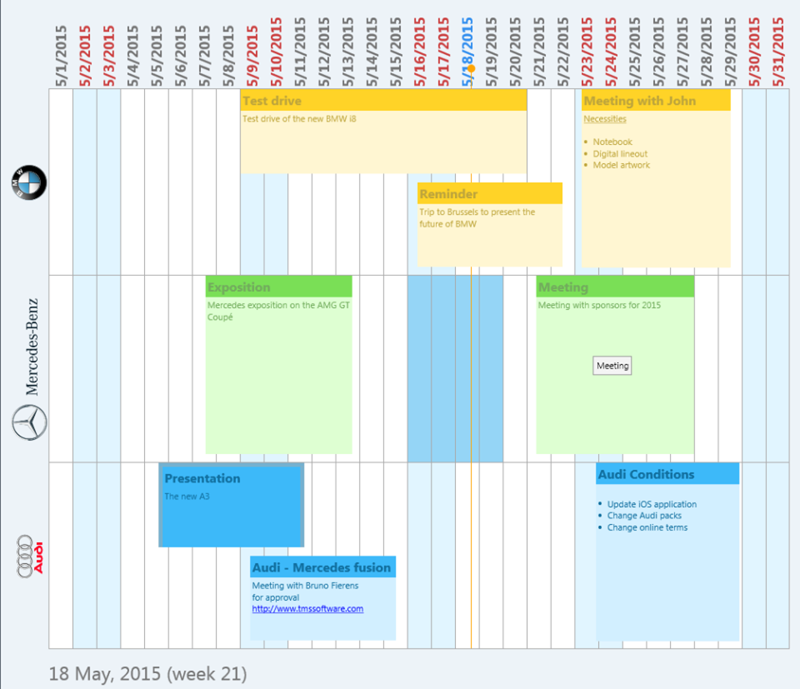 The timeline in the TTMSFMXPlanner is configurable. Default, it represents the standard 24hr timeline but this can be easily changed to month mode, a day period mode, a half-day period mode, multi-month mode or a custom timeline mode. With the custom timeline mode, the unit of time along the timeline can be fully programmatically set. 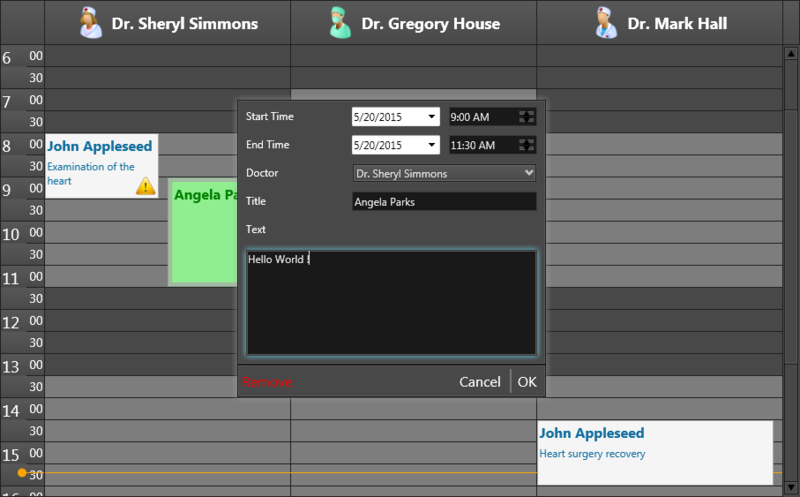 In one of the included demos will be a timeline in seconds mode that represents a schedule of TV-adds. 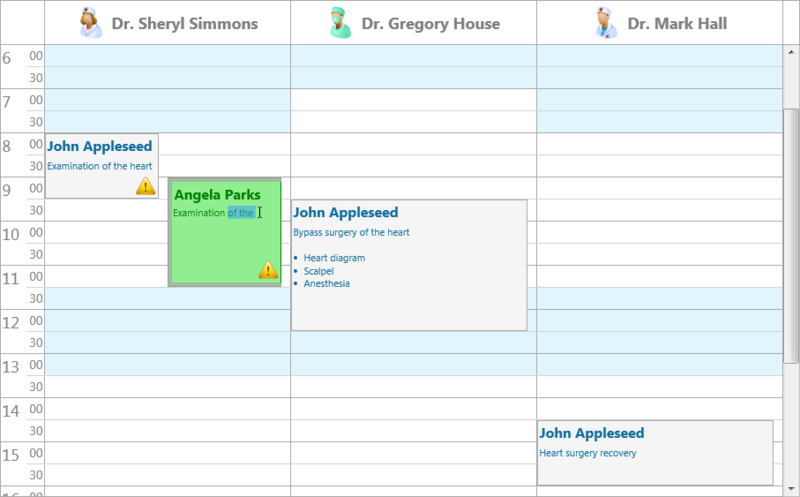 Within the displayed timeline, the TTMSFMXPlanner has the notion of active and inactive time, typically used for open office hours that can be shown in a different collor as well as various ways to to display the actual time on screen. In addition, for period, month, multi-month modes, specific days of the week can also be set as inactive time. 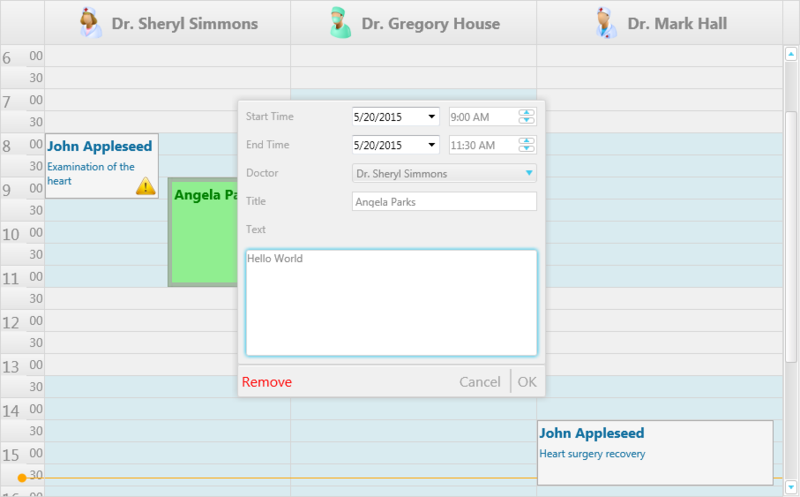 Also for editing events in a TTMSFMXPlanner view, we went to great lengths to offer built-in easy to use and flexible to customize editing capabilities. First of all, changing the start time, end time or dragging the event to a different day or resource is optimized for both classic desktop mouse & keyboard interaction as touch based mobile device operation. 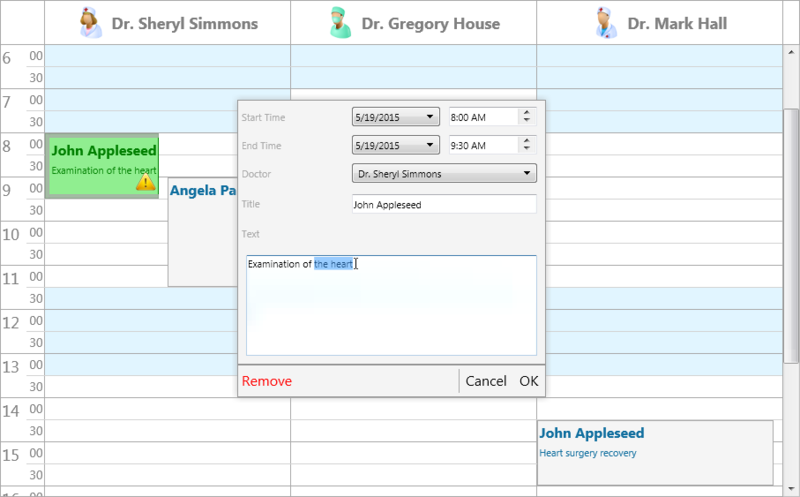 Editing of event notes can be done via inplace editing or via a popup dialog. Both inplace editing and use of popup dialogs can be fully customized. If you want to hookup your TTMSFMXPlanner to a cloud calendar service, we have the adapters ready for you that let you interface the TTMSFMXPlanner to a Google calendar or Microsoft Live calendar. 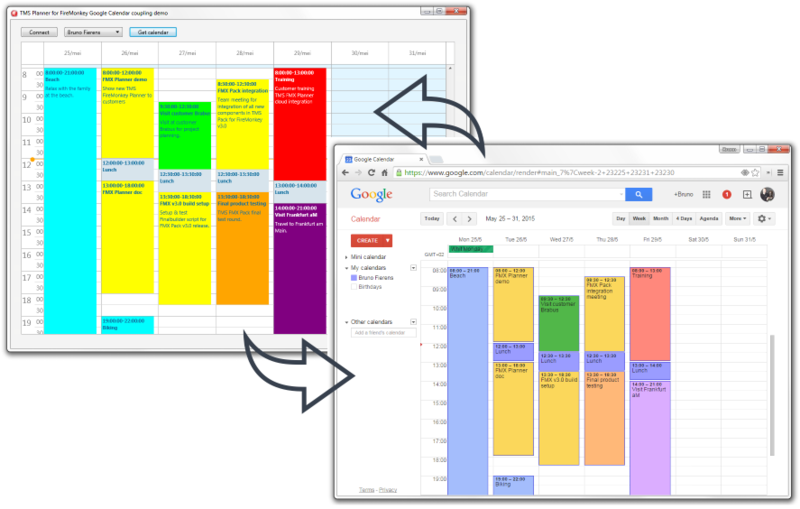 This is achieved by an adapter that interfaces the TTMSFMXPlanner via TTMSFMXPlannerGoogleAdapter or TTMSFMXPlannerLiveAdapter to TMS Cloud Pack components for access to these cloud calendar services. We realize that scheduling applications all have different rules and particularities. Therefore, the TTMSFMXPlanner has overall extensive customization capabilities. From putting custom text in timeslots, defining event conflict handling, restricting events to resources, custom drawing over events, timeline, resource header, editing validation and much much more. And of course, the TMSFMXPlanner also visually automatically integrates with the selected FireMonkey application style. All this and more is coming to you in the next major release of TMS Pack for FireMonkey. This new version will be free for all active registered users. really looking forward for this :) well done. Vendors like TMS is what will help FMX be a success. This planner is looking nice. Kudos! have you the adapter in order to sync with CalDav server ?